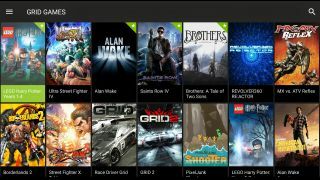 Nvidia's Grid service is gradually turning into a gaming powerhouse, and today it takes the next step with a new public beta that will let you stream games to Shield at up to 1080p, 60fps - excess of what some consoles can handle. The beta will be free to all Shield owners until June 30, after which point the 1080p, 60fps option will come at a cost. Nvidia is yet to confirm what that cost will be. Grid currently has just 35 games that can run at 1080p, but as the servers upgrade from Kepler to Maxwell architecture, more games will get it. As Nvidia told us, it "doesn't want to cripple a game" for the sake of pushing boasting a higher resolution. Batman: Arkham Origins and Ultra Street Fighter 4 are among the games supported right now. Shield owners can access Grid from inside the Shield Hub application. You'll also need to connect your Shield device to a full HD TV in console mode and have a minimum download speed of 30Mbps, as well as a router that's compatible with Shield (most modern ones will be). If your connection is struggling, the service will automatically drop the resolution and framerate so that your gameplay doesn't suffer. However you won't be able to run games at 1080p, 60fps on your Shield tablet or portable. Nvidia believes (quite rightly) that these specs are rather pointless on such a small screen, so it will be kept for TV gaming. Nvidia Grid: just how good is it?